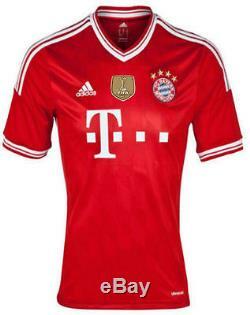 ADIDAS BAYERN MUNCHEN HOME JERSEY 2013/14 INCLUDES FIFA 2013 CLUB WORLD CHAMPIONS PATCH. Suit up like they do at the Allianz Arena in this men's football jersey. A short sleeve replica of der FCB's home jersey, it features their team badge on the left chest, "Bayern Munchen" printed on the upper back and "Mia san Mia" below the back collar. Ventilated climacool® keeps you cool and dry. Mesh ventilation inserts; Striped ribbed cuffs. Football Club Bayern Munich badge on left chest; "Bayern Munchen" printed across upper back; "Mia san Mia" printed below back collar. The item "ADIDAS BAYERN MUNICH HOME JERSEY 2013/14 FIFA CWC PATCH" is in sale since Tuesday, February 07, 2017. This item is in the category "Sports Mem, Cards & Fan Shop\Fan Apparel & Souvenirs\Soccer-International Clubs".